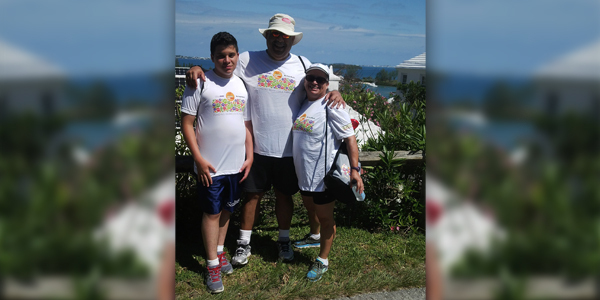 Since the introduction of the Colonial Wellness Programme in Bermuda in January 2014, participants across the eight participating companies have walked more than 621 million steps and increased their physical activity by a fifth, including Maria Pichery of Ironshore. The Colonial Wellness Programme is offered in partnership with Virgin Pulse, part of the world-wide Virgin group of companies. Ironshore launched the Colonial Wellness Programme in early 2015 and reports 74 percent of employees participating and more than half of their employees reaching the 7,000 steps per day, the programme’s recommended amount of steps. Mrs Pichery said, “Virgin Pulse motivates and pushes me to be more active. At work, instead of me sitting at my desk during my lunch period, I make an effort, and also encourage others, to walk around the block. “Since we’ve been introduced to Virgin Pulse we have become more active in our daily lives because of the gradual objectives, challenges and goals that come with programme. Naz Farrow, Colonial’s Chief Operating Officer – Health, said, “The figures are impressive and show the huge efforts put in by people to improve their health and well-being. Jacqueline Perreault, Colonial’s Corporate Wellness Director, who is responsible for the wellness strategy in all of Colonial’s jurisdictions said, “What we have seen from this wellness programme is that people are caring for themselves and setting a great example for others to follow.